Of the major mobile wallet options—including Samsung Pay, Walmart Pay and Android Pay—Apple's offer is so far the most popular. According to research from PYMNTS, Apple Pay's latest usage rate reigns at 5.5 percent, with Walmart Pay following in second place at 5.1 percent. In fact, since November 2014, the number of mobile device owners who've used Apple Pay jumped from 9 percent to 24.5 percent, according to further PYMNTS research. 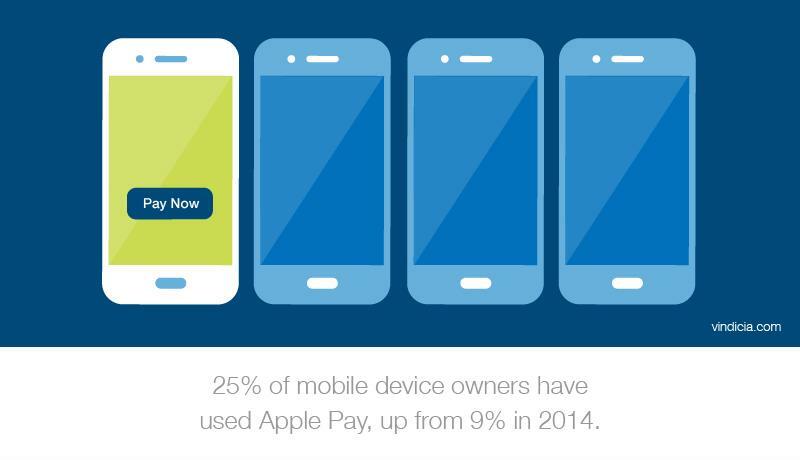 Research shows Apple Pay is the leading mobile wallet. As for Apple itself, the company seems pleased with the way users are taking to the mobile pay platform. As Fortune noted, Tim Cook announced during a conference in May that the number of Apple Pay transactions rose 450 percent during the prior quarter compared to numbers seen a year earlier. While Apple Pay admittedly hasn't revolutionized the payments industry quite yet, it's important to consider that this payment method is only three years old. It took time for consumers to transition from checks to credit and debit cards, and now it's nearly impossible to find a person who carries around a checkbook. By the time Apple Pay and other mobile wallets become the main consumer preference, the payments ecosystem will be too complex for subscription businesses to navigate. They need to get a grasp of things early so they're prepared for the future. Statistics from Mastercard show the consumer conversation about new payment methods is dominated by mobile wallets, indicating significant excitement about their possibilities. Per the Mastercard Digital Payment Study, which analyzed over 3.5 million conversations about payments across numerous social media channels this year, 75 percent of these discussions focused on digital wallets. Overall, mobile wallets received over 2 million mentions on Facebook, Twitter, Instagram and Weibo, China's dominant social media platform. What's more, 72 percent of these mentions were positive. Additionally, according to Juniper Research, the number of new Apple Pay shoppers has almost doubled year-over-year, CNET reported. The total number of users is expected to hit 86 million by 2017's end. Plus, with features like the iPhone X's Face ID making using a smartphone for all sorts of matters even easier and more convenient, we expect Apple Pay adoption will grow tremendously over the next few years. With all of this evidence, it's clear that subscription businesses need to add Apple Pay to their accepted payment methods. Vindicia is pleased to announce that our product is now integrated to provide Apple Pay for subscription businesses, further solidifying our place as the world's leading subscription business solutions provider.